Dr Eugenie Clark of the Mote Marine Lab has published this photo in the scientific journal, AQUA the International Journal of Ichthyology: aqua vol. 17 no. 4 - 15 October 2011. It has a two page spread starting on p. 220. Over 2700 Plotosus were estimated to be in this swarm in North Sulawesi. 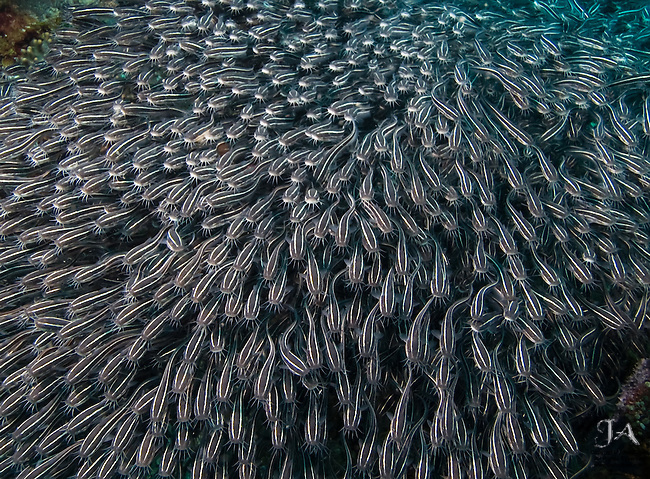 This may be the largest swarm ever photographed of Plotosus lineatus. Technically, this is a swarm, not a school.